Vaccine Discussions May Be Most Helpful During Early Pregnancy : Shots - Health News A mother in Greenville, S.C., was startled by how many parents were opting not to immunize their kids, so she started her own group to counter misinformation about childhood vaccinations. Thirty-three-year-old mother Kim Nelson started a vaccine advocacy group in Greenville, S.C., to help reach vaccine-hesitant families. 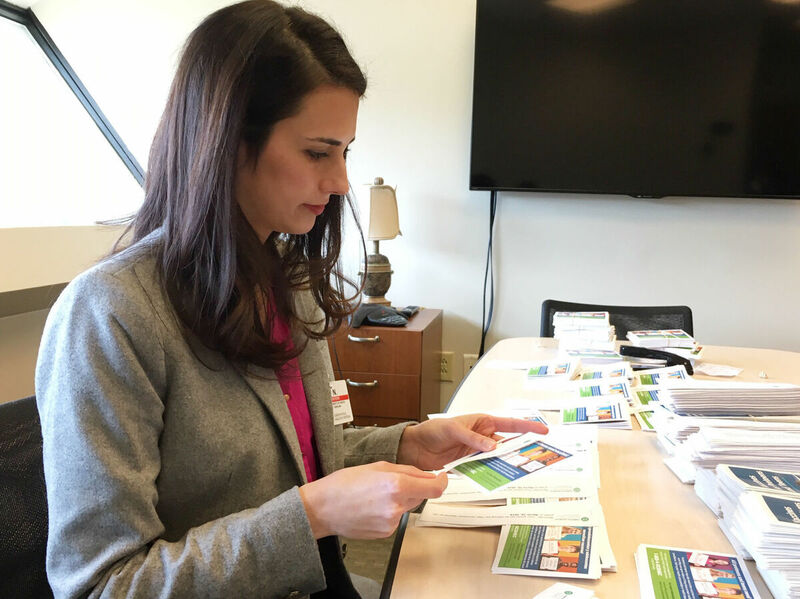 Here, she prepares vaccine information flyers for public school students. In 2017, Kim Nelson had just moved her family back to her hometown in South Carolina. Boxes were still scattered around the apartment, and while her two young daughters played, Nelson scrolled through a newspaper article on her phone. It said religious exemptions for vaccines had jumped nearly 70 percent in recent years in the Greenville area — the part of the state she had just moved to. She remembers yelling to her husband in the other room, "David, you have to get in here! I can't believe this." Up until that point, Nelson hadn't run into mom friends who didn't vaccinate. "It was really eye-opening that this was a big problem," she says. Nelson's dad is a doctor; she had her immunizations, and so did her kids. But this news scared her. She knew that infants were vulnerable — they can't get started on most vaccines until they are 2 months old. And some kids and adults have diseases that make them unable to get vaccines, so they rely on herd immunity. Nelson was thinking about public health a lot back then and was even considering a career switch from banking to public health. She decided she had to do something. "I very much believe if you have the ability to advocate, then you have to," she says. "The onus is on us if we want change." Like a lot of moms, Nelson had spent hours online. She knew how easy it is to fall down internet rabbit holes and into a world of fake studies and scary stories. "As somebody who just cannot stand wrong things being on the internet," Nelson says, "if I saw something with vaccines, I was very quick to chime in 'That's not true' or 'No, that's not how that works.' ... I usually got banned." "If someone posts, 'My child got their two-months shots today,' " Nelson says, she'd quickly post a follow-up comment: "Great job, mom!" Nelson was inspired by peer-focused groups around the country doing similar work. Groups with national reach like Voices for Vaccines and regional groups like Vax Northwest in Washington state take a similar approach, encouraging parents to get educated and share facts about vaccines with other parents. Nationally, 91 percent of children ages 19 to 35 months old have their vaccination for measles, and rates for other vaccinations range from 82 to 92 percent. But in some communities the rate is much lower. In Clark County, Wash., where a measles outbreak is up to 63 cases, about 76 percent of kindergartners come to school without all their vaccines. Pediatricians could play a role — and many do — but they're not compensated to have lengthy discussions with parents, and some of them find it a frustrating task. That has left an opening for alternative approaches, like Nelson's. "It's easier to pull a hesitant parent over than it is somebody who is firmly anti-vax," Nelson says. She explains that parents who oppose vaccination often feel so strongly about it that they won't engage in a discussion. "They feel validated by that choice — it's part of community, it's part of their identity." The most important thing is timing: People may need information about vaccines before they become parents. A first pregnancy — when men and women start transitioning into their parental roles — is often when the issue first crops up. Nelson points to one survey study from the Centers for Disease Control and Prevention that showed 90 percent of expectant women had made up their minds on vaccines by the time they were six months pregnant. "They're not going to a pediatrician [yet]," Nelson says. "Their OB-GYN is probably not speaking to the pediatric vaccine schedule. ... So where are they going? They're are going online." Nelson tries to counter bad information online with facts. But she also understands the value of in-person dialogue. She organized a class at a public library and advertised the event on mom forums. Nelson was nervous that people opposed to vaccines, whom she calls "anti-vaxxers," might show up and cause a scene. She had already been banned from some online forums by vaccine opponents. "Are they here to rip me a new one? Or are they here to learn about vaccines?" Nelson wondered. "I just decided, if they're here I'm going to give them good information." Amy Morris was pregnant, but she drove an hour and a half to attend the class. Morris wasn't the typical first-time mom Nelson was trying to reach. She already had three kids. But during this pregnancy, she was getting increasingly nervous about vaccines. She had recently had a miscarriage, and it was right around the time she had gotten a flu shot. Morris had been reading pro- and anti-vaccine posts in the mom forums and was starting to have some doubts. In Nelson's class, she learned the risks of not vaccinating. "That spoke to me more than anything," said Morris. Now, holding her healthy 8-month-old son, Thorin, on her lap, she says she's glad she went, because she was feeling vulnerable. "I always knew it was the right thing to do," Morris said. "I was listening to that fear monster in the back of my head." Nelson says that fear is what the anti-vaccine community feeds on. She has learned to ask questions to help parents get at the root of their anxiety. "I do think they appreciate it when you meet them sympathetically and you don't just try and blast facts down their throat," Nelson said. Nelson is now trying to get local hospitals to integrate that vaccine talk into their birthing classes. She's studying for a master's degree in public health at the University of South Carolina and also works with the Bradshaw Institute for Community Child Health & Advocacy. She's even considering a run for public office. This story is part of NPR's reporting partnership with WFAE and Kaiser Health News. An earlier version of this article said 91 percent of children under age 3 were vaccinated for measles. That percentage is actually for children ages 19 to 35 months.